For the past year and a half, Jake Reissig has had the same daily routine. Every morning, the 86-year-old goes to mass. After church, he meets one of his 9 children for coffee. Then he goes back home, walks to his rose garden and clips off a single rose. He brings the rose to a cemetery to visit the plot of his wife of 65 years, Elizabeth. "Liz," as he calls her, was always "dressed to the tee," his son, Roger, told CBS News. "She was beautiful to him." That's why the widower, who needed a place to go talk to her, brings a rose to his wife every day -- the same as he did each day he was married to her. This summer, with Texas facing a severe drought, the Conroe resident was worried the grass around her plot would dry up. 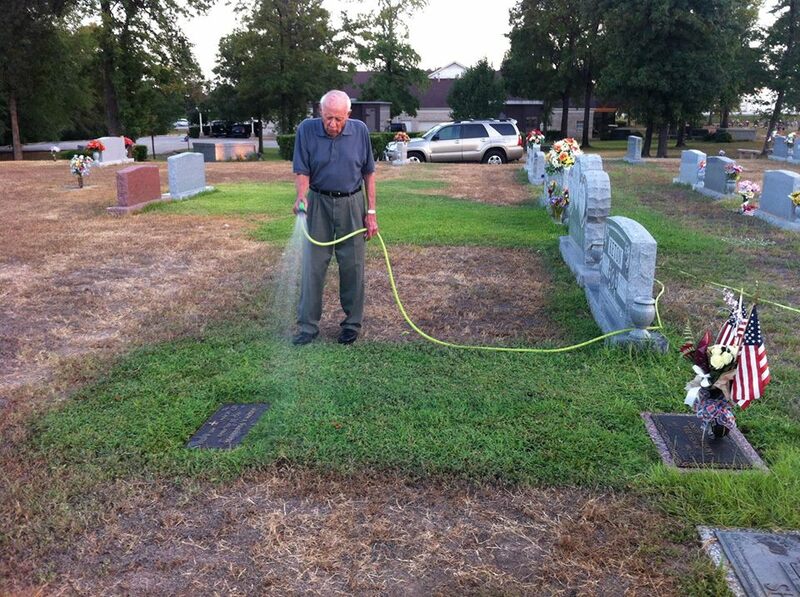 When the grass started to turn crispy and brown, he took a hose and watered the lawn around her stone twice a day. Suddenly, that became a new part of his routine. "He's just a giving person," said Roger, who occasionally goes with his dad to water the lawn. "When I saw it -- I just couldn't believe it." The next time Villasenor's family members visited his grave they couldn't believe their eyes. "They thought it was a miracle," Roger said. When Villasenor's parents visited his grave and spotted Reissig standing there, they immediately hugged him. Reissig turned to the soldier's mother and asked, "Do you want to water it?" "They couldn't believe a stranger would do that for him," Roger said. But Reissig says he's not a stranger. He talks to "Joe" every day while he waters the grass. "The way dad treated mom and all of us -- it's not a surprise," Roger said. Roger posted his dad's story on Facebook. Thousands of people shared it and hundreds commented. "What a beautiful tribute," one user said. "Your mom and dad's romance is not over," another commented. They're right, Roger said, "It was storybook."